We became lenders on Kiva shortly after buying our Bed & Breakfast to assist other small business owners in realizing their dream of making their businesses successful, while helping in the fight against global poverty. This week, we partnered with 13 other lenders on Kiva to help our 20th entrepreneur, Leonora Debarbo (pictured above). 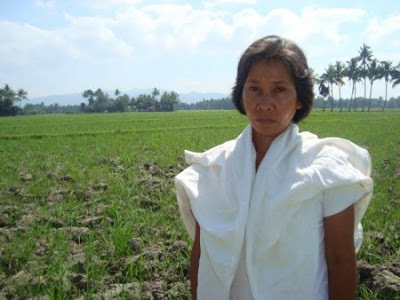 Leonora lives in the Phillippines, where she has been farming since 1995. She wants to expand her business, so she’s asked for a loan to buy farm supplies. We wish Leonora much success with her business! One cool thing we like about Kiva is that they have people called Kiva Fellows, who travel to the countries where the business owners live to file progress reports in what’s known as a “Kiva Field Update”. This allows lenders to often get a closer look at the people they are helping or to see that borrower’s progress with his or her business, to learn about the Field Partners (the microlending institutions that disburse the loans and check on payments), and to learn about the countries as well. Can you think of anything more encouraging for an entrepreneur in rural Senegal than showing her that her business is supported by people all over the globe who appreciate her hard work? Most borrowers react as follows: they first gaze at the sheet in unbelieving amazement, say “wow” and then receive the profile with a smile on their face. Reading that in the same hour that we clicked on “lend” for our next Kiva loan was a nice way to end the day today.